A long protracted state of shock that began on 24 January of this year is just now beginning to fade. It delayed the opening of my photo studio and won't be resolved any time soon. Time stands still and life goes on at the same time. I am not going to go into the details, because it is so complicated and distressing. The blog is not a place for complicated and distressing, I am sure you agree. It's time to leave it be and come back to regular positive meditation. So onward to more simple pleasures. An alto is practicing through an open window, her voice trailing beautifully down over the mess that was to be my photo studio, filtering through rusty uninvited girders, northern sunlight hitting the sheers I put up to filter out this violent forced intrusion. It is only a part, I remind myself, and turn away. In the front, we have the kitchen. One life lesson I can positively confirm, since I have lived it a few times already, is that signing up to take a test is the very best way to beat any resistant skill into form. Horrible French grammar? Sign up to be tested. I did this with learning French, and I am now doing it with French pastry. I didn't know a salambo from a St. Honoré, but now I am proud to say that my French pastry knowledge has solidified into real skills. I will no longer be a lopsided cook. When people ask: "sucré ou salé" I will answer "Both." No mention of the drastic measures I took to get here. 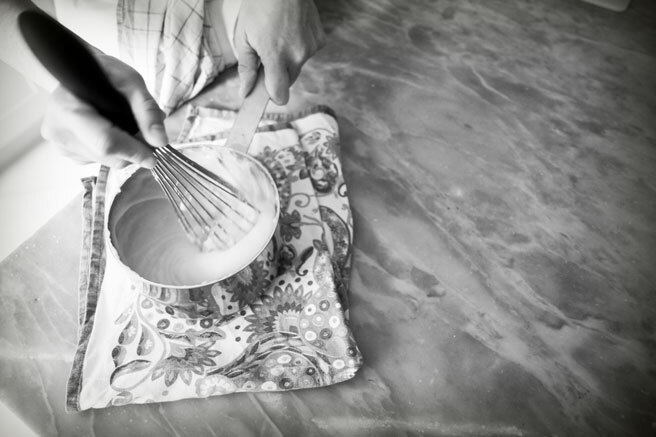 Claire has been very patient with me, covering everything from my slovenly habit of cracking the egg on the side of the bowl to how to yield a whisk until it feels like my arm is going to fall off. It is liberating to be watched and guided and critiqued and contemplate the hows and whys, then come out with this fabulous array of almost unreal, caricatural vintage French pastry from my own hand, sore shoulders and aching back to prove it. I savor the anxiety before my pastry sessions and the relief I feel at the end of the day. Much of my learning takes place before and after the actual baking. In the beginning, I started each pastry session feeling like I couldn't do it and somehow managed to overcome to the extent that now I know I can. There is something in it that is improving me, stretching me. I can now walk through the steps and then execute them with precision. I am ever so thankful to Claire for this. If I don't pass the first time, I will have all of this in any case, and I will have made a good friend. The classes in the Plum Lyon kitchen have begun and while the season ramps up, planning these classes and seeing the pleasure in the students' faces is worth all the sweat and tears that have gone into this whole project. It makes everything else fall away. One year ago, it was a dream, we'd signed papers, and were waiting for the legal cog to fall into place. Now I work here in what was once the laboratoire, writing recipes, exploring years of notes about the little things that are just now being placed on Lyon's market tables, anticipating what the next class might bring. Some classes are taught with the sun blazing in through the front windows, illuminating just about everything that is good about sharing knowledge and nurturing in general. Others are taught at night, the light of the kitchen blazing out onto the square perched above the twinkling city. I have taught people how to carve rabbits, what to do with several species of wild mushrooms, nettles, and other foraged things. We've wielded piping bags and bain maries, classic dishes and impromptu decisions intermingle and most of all, we are having fun. The desserts are more fun than I ever thought they would be, the cheeses and the wines, reminders that all this organized research is paying its dividend now. Inspiration is coming from all sources, most of all this bouyant life in green rolling through and lifting me up just the way I hoped. Thank goodness for Spring, and thank goodness for multi-faceted business plans. I am sorry to hear about what has you shock, except of course I'm unsure what I am sorry for. 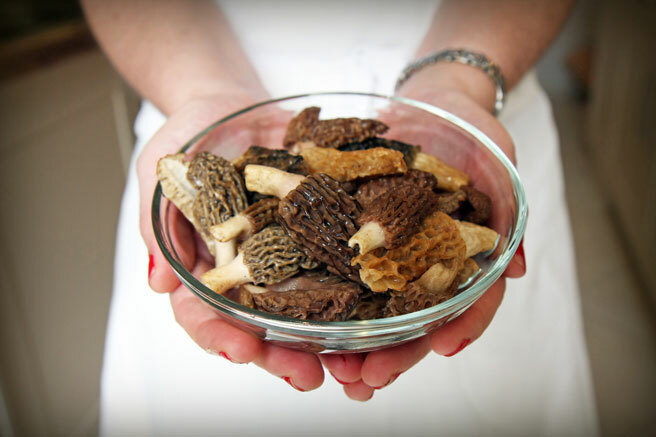 The idea of a few hours with you and others in that kitchen learning about rabbit or morels or whatever is fresh and wonderful is so appealing. Much success is my wish for you, along with the stamina and wisdom to cope with it! Que Dieu bénisse toi, ta famille, Plum Lyon et Saint Honoré. Oh my, I was sadly thinking that you might never return,sorry that you had to go through a difficult time, but so glad you are back. 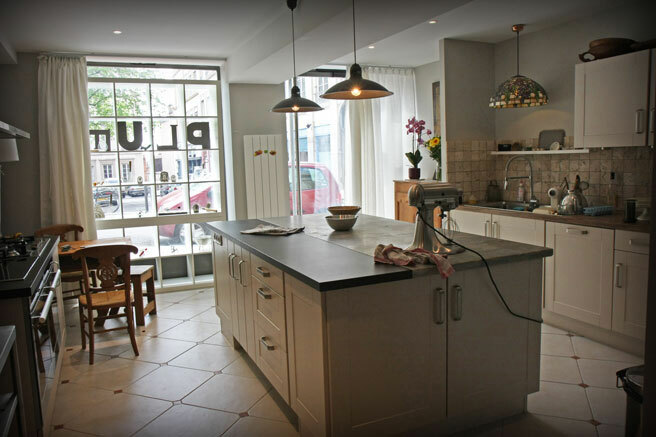 Your studio looks so inviting, if only it were much closer,I would be SO there!Please show some of your pastry creations creations,would love to see more of those. 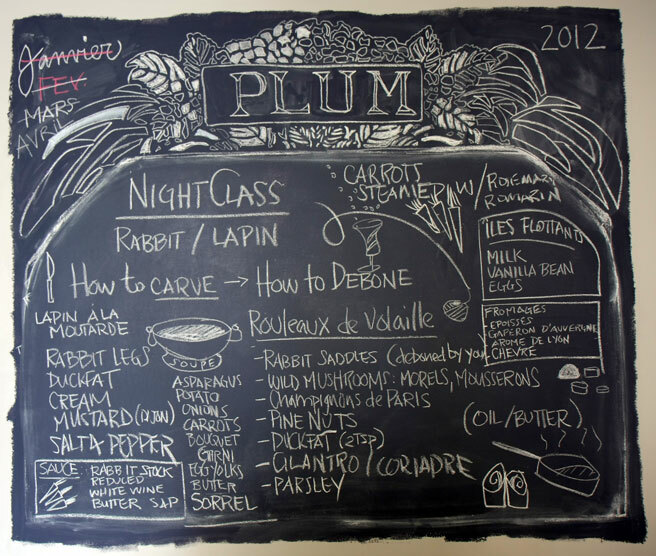 What a fabulous chalkboard creation,are you the talented one? It's amazing! Welcome back! So nice to "read" you here again, Lucy. I like the way you put the reason for your blog downtime. It will help me begin again, as my reason has been a stumbling block too big, in my mind, not to share but cannot be shared. Thank you. Courage! Your kitchen looks lovely. You write so eloquently. 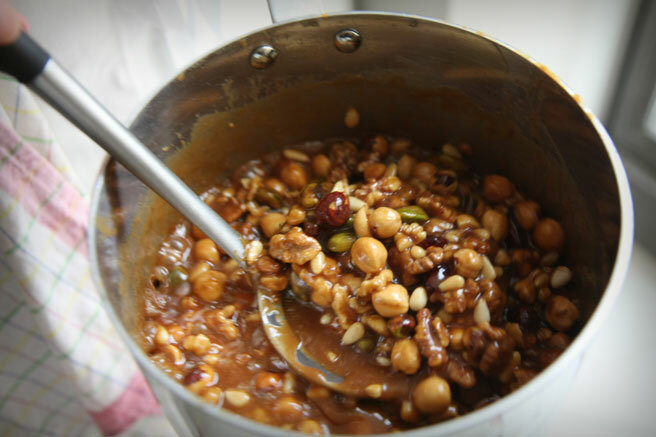 It always makes me happy to read your blog entries - it makes me feel as if I'm present in your kitchen. I hope that you find peace in your time of distress. It's always lovely to see your name pop to the top of my sideboard! All the work of your hands and mind is meditatively beautiful somehow, from the rustic crust you excuse yourself from dinner guests for a moment to stir up from memory, so as to have the dessert at its perfect moment, to all the finished, arranged and artfully presented photos which I return to over and over. (There's nothing like a hot Summer moment gazing at that lovely tableau of the icy elegance on the cake-stand, with the silvery spokes of spoons waiting). May your buoyant life in green continue to roll gently forward and lift you wherever you want to go. And thank you for inviting me along on such a splendid, colourful journey. It is soooo good to hear from you! I kept checking back, knowing that you must be incredibly busy and involved in your project. First, your kitchen is gorgeous! Next, I want to run over and take a class! I would love to be there in your beautiful space and also study French pastry as you are doing. Brava! 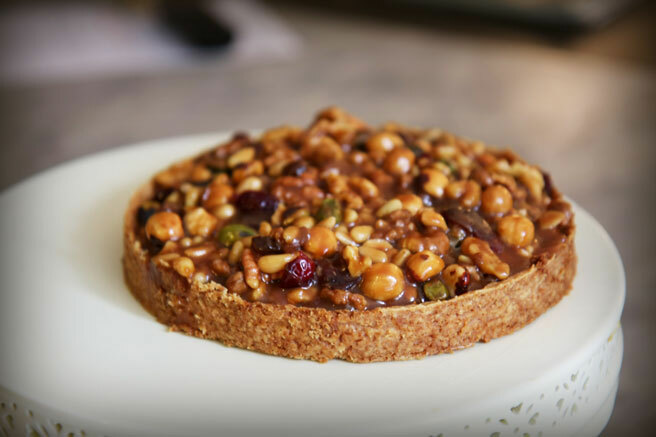 Lucy, is that a nut and caramel tart that you are showing? Would you mind sharing the recipe, it looks delicious! Hey Wendy, yes it is a nut and caramel tarte and I will definitely be posting the recipe. Your wonderful writing and beautiful photography are back... Suis la plus heureuse des lausannoises ! I am also glad to read your posts again. I assumed you were busy, but it seems you also had some very sad moments. I am very sorry. Your kitchen looks amazing! Congratulations and good luck with your adventure. You are truly a brave woman!! Good to have you back Lucy, missed your posts. Wishing you and your family all the best. I am sorry there has been a setback. But yes, good to see this lovely post. I have missed you and my other food-blog friends. You add something to my life!